Great news for those who like to ride the waves of the latest trends in technology, as the newest Daydream View VR from Google is now available for purchase at Best Buy at half price. It's one of the best choices if you are into the VR stuff, even if it doesn't offer the same level of immersion like HTC's Vive or Facebook's Oculus. The Daydream View VR is an improvement over the original headset, so it's worth the upgrade at this price. 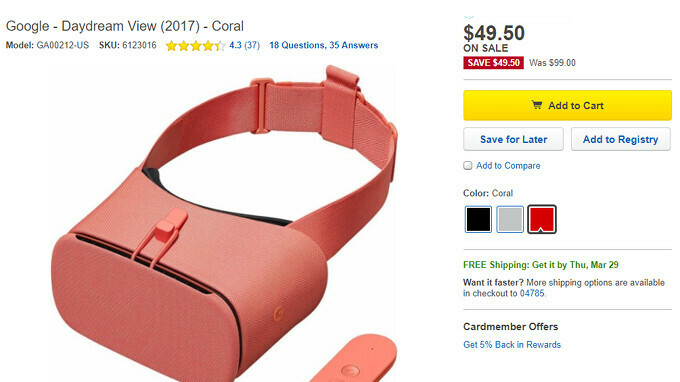 Speaking of which, Best Buy is selling the Daydream View VR for just $59, although it's usually available for $100. There's a catch though, as the deal is only valid until the end of the day. Also, it looks like Fog color version of the headset is already sold out, so you'll have to choose between Charcoal and Coral. The Daydream View VR headset comes with a small remote in the box, as well as a removable top strap and guidelines on how to make use of what it has to offer. Daydream View also supports Steam VR as well. Plus you can browse the web using Chrome and the controller. Not to mention it supports Cardboard apps as well. I purchased it two days back from zoom.com.kw (black color) not this one.